My posts lately have been very hexagon intensive, so I'll save the hexagon post I prepared for tomorrow. My first Spring to Finish 2010 finish! I finally finished my charcoal and orange placemats. They are super crinkly after washing. Super crinkly. 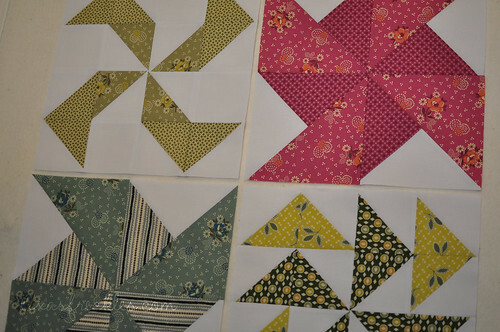 I finished my last four pinwheels for the pinwheel sampler. I'm seeing a pattern emerge here though. 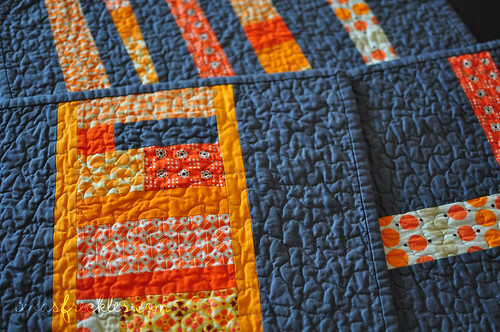 The next step is sashing and I have another project (the paintbox quilt) waiting for sashing. Sashing my be my least favorite part of the make-a-quilt process. 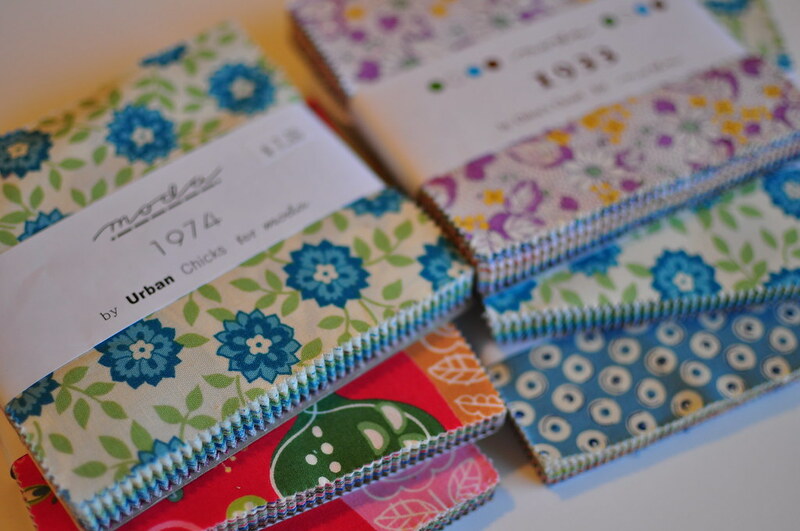 I picked up some fabrics my LQS last week. I already had that Pez but I was taking photos earlier and thought this stack looked pretty. It's gradually grown over the week as I stacked newly acquired fabrics on top of the Pez. I found some 1974 charm packs and a Recess charm pack online and they arrived today. The 1933 pack and the Tweet Tweet packs came home with me yesterday. I don't have plans for any of these yet, but I'm hoarding the 1974 and Recess. I hope you are having a happy Wednesday! See you tomorrow. What is the name of the LQS you go to? I have been to Cabbage Rose on my visits to Fort Worth but I just noticed that I will be living close to Berry Patch Fabrics (we are moving just south of Hulen Mall). It Berry Patch a good fabric shop. I really liked Cabbage Rose. 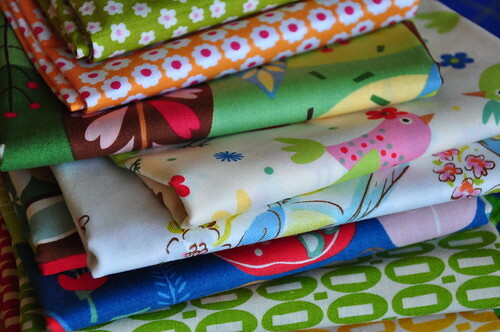 I love the pink bird fabric in your stack. Do you know who designed the fabric? Love the fabric! I wish we had a quality local quilting store. Can't wait to see what you make. Anita - The fabric with the pink birds is from Moda's new collection 'Tweet Tweet'. It's a really cute line! all so cute...but I am totally diggin' those placemats. they are a bit crinkly, but still beautiful. sashing is a pain isn't it?! but it looks so pretty, so we have no choice but to do it!! great placemats! i too really dislike sashing. every time i forget how time consuming and painful it is. i love the placemats!! orange is my favorite color! What a fun Wednesday! Congrats on finishing your placements - they are gorgeous. Good luck with those sashings (not my favorite step either). 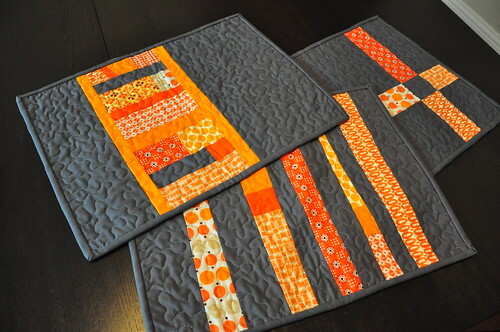 Those placemats have really stayed in my head, the grey/orange contrast is fantastic!